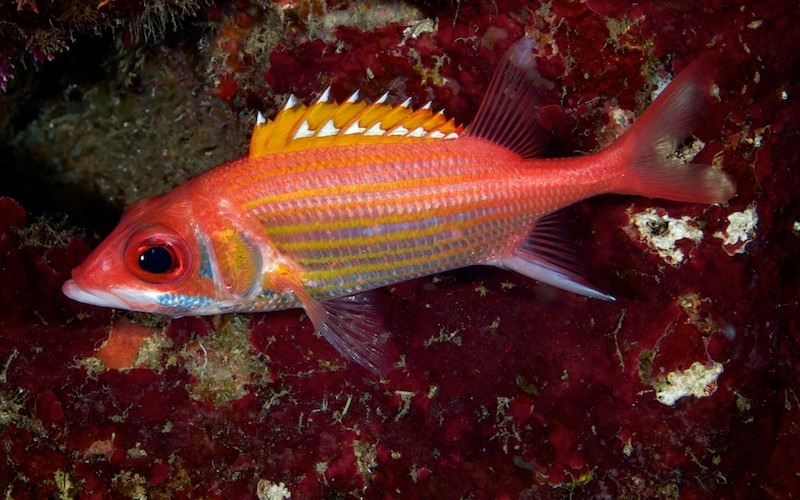 Caption: Also known as Crowned Squirrelfish, Barred Squirrelfish, Red Squirrelfish and Crowned Soldierfish. Found in schools over shallow reef crests to deep along walls, in large caves, swimming close to the bottom. Dorsal fin on the back looks almost black with natural light in deep water. They feed nocturnally on smaller fish, crabs and shrimps. Length - 17cm Depth - 1-30m Widespread Indo-Pacific Squirrelfish are nocturnal hunters feeding near the bottom on small fish and swimming crustaceans. During the day they often congregate close to reefs and in caves, sometimes found upside down in caves. Their colour can change greatly in different lights and if threatened. Some of this family have venomous spines.